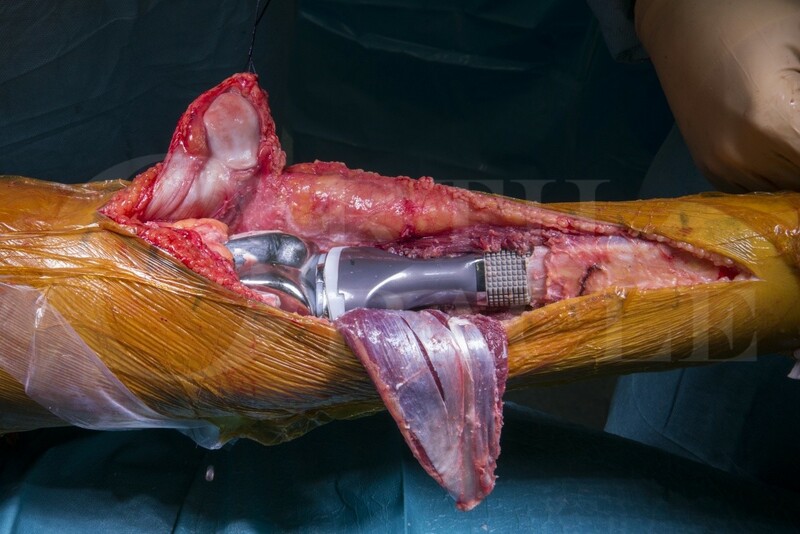 Learn the Proximal tibial endoprosthesis (Stryker) for osteosarcoma surgical technique with step by step instructions on OrthOracle. Our e-learning platform contains high resolution images and a certified CME of the Proximal tibial endoprosthesis (Stryker) for osteosarcoma surgical procedure. Osteosarcoma is the commonest primary bone sarcoma arising in the young adult population, with a peak incidence in the second and third decade. Treatment following diagnosis comprises neo-adjuant chemotherapy followed by surgical resection of the tumour, either by limb salvage or limb sacrifice. Reconstruction following tumour resection most commonly comprises either biological reconstruction or reconstruction using an endo prosthetic replacement (EPR). The most common sites for osteosarcoma are the distal femur and proximal tibia, followed by the proximal humerus and distal radius. The most common histological variant of osteosarcoma is a high grade osteoblastic variant. The commonest endo prosthetic reconstruction used in the UK is that available from Stanmore Implants Worldwide (Stryker). This is available as a modular or custom made option with either fixed or rotating hinge options for reconstruction of the knee. Fixation is usually with cement and for high risk body sites, including the proximal tibia, surface treatment with a silver coating is often used in an attempt to reduce the risk of infection.